Love the Angry Birds Game? Then here is your chance to flaunt your love for Angry Birds on your Laptop or your desktop computer. The Windows team has released a new theme for Windows 7 operating system based on the Angry Birds game. No Doubt, the game which started for mobile platforms has become so famous, that it now gets featured in academics as well! The theme has some nice wallpapers featuring the pics and the various birds in the game - like the Red Bird, Yellow Bird, the Bomb Bird etc. The notification sounds and others system sounds in this theme are replaced by all the chirping noises from the various birds as in the Angry Birds game. Can't wait enough? 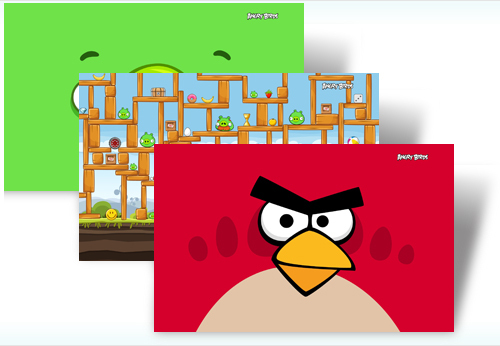 You can download the Angry Birds theme for Windows 7 directly from this link. This theme works on all Windows 7 Home Premium, Professional, Enterprise, or Ultimate editions.